If you want to achieve a radiant glow/glowing look and immediately visible results, to rejuvenate your face and body and to bring attention to your most appealing features, Esthetic Style Center is your best choice. Our Center takes pride in use of the latest-generation products, professionalism and high level of expertise of its staff. The applied methods are modern and in line with the latest global trends, while the equipment is the state-of-the-art. Our best recommendation is a unique BEAUTY of our patients and look which is defined by a modern trend of a well-groomed woman or a man. Contact us to acquire more information and learn why we are special! You will be treated by doctors of enviable reputation and experience in anti-aging medicine and dentistry. The procedure requires local anesthesia and it is pain-free. You will get the desired shape of lips in just 15-30 min. The lips will be sensual, attractive, naturally enhanced and significantly rejuvenated. IPRF is a unique method which is entirely natural, without presence of any chemicals, thus producing a 100% natural substance, which is as such applied to the skin. IPRF is a fibrin rich in thrombocytes, intended for use in liquid state for easier application by injection. Hyaluronic acid is naturally present in every human body, primarily in skin, and accounts for its youthful, fresh and healthy look. Its amount decreases by aging, but we can replace it with hyaluronic fillers and thus correct fine lines and deep wrinkles and hydrate the skin. 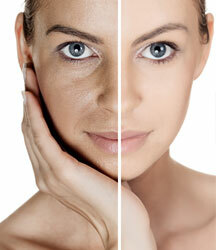 Mesotherapy is a very effective procedure, widely used for esthetic purposes, in rheumatology and for pain treatment. In 1987 the French Academy of Science included mesotherapy in official medical disciplines. Deep rejuvenation treatment implies combined use of Dermafix apparatus for mechanical skin stimulation by hexagonal microneedles and skin stimulation by the most advanced serums (cocktails). DISCOUNT ON A DESIRED TREATMENT. Please fill in the following form to make an appointment. We will confirm the availability of the date and time by an e-mail.